And behold, it came to pass that on the 12th day after the Spring Equinox, and the day after the Great Festival of Easter that a gathering of pilgrims set off on their annual journey to the great outdoors. Pilgrims from the North, from the South,(South Kirkby) from the East (Barmston) and from the West (St Annes) departed at 9am to see and enjoy the delights of Ilkley and Skipton. As they travelled, two fine damsels passed among the awestruck voyagers selling tokens of fortune, and some of the tokens were profitable and it was good. 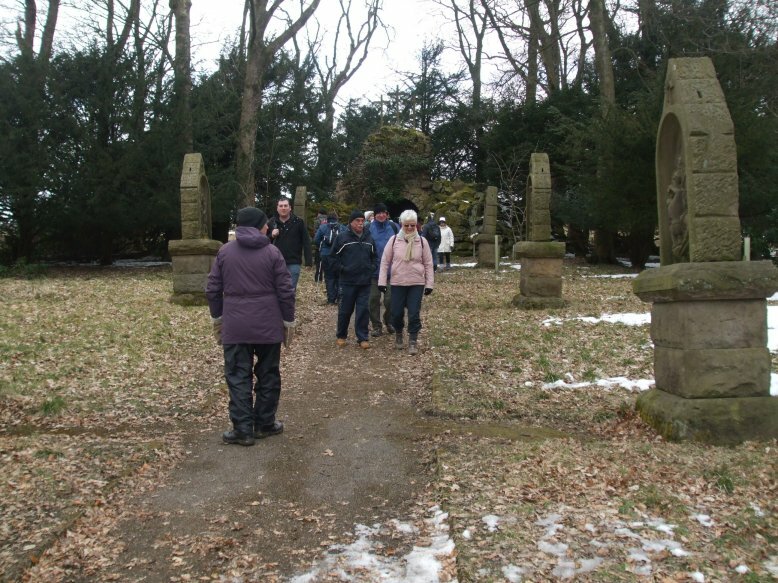 On arriving at Ilkley the intrepid ramblers disembarked from the grand coach of Poppleton, after the brief visit to the 'Palace of Relief ' they started their trek into the woods and hills in the surrounding countryside. Those that did remain on the bus did journey on to the town Skipton to pursue the market stalls and perhaps purchase many of the bargains that were offered. Some may have sought solace in the coffee shops and the pork pie shop. 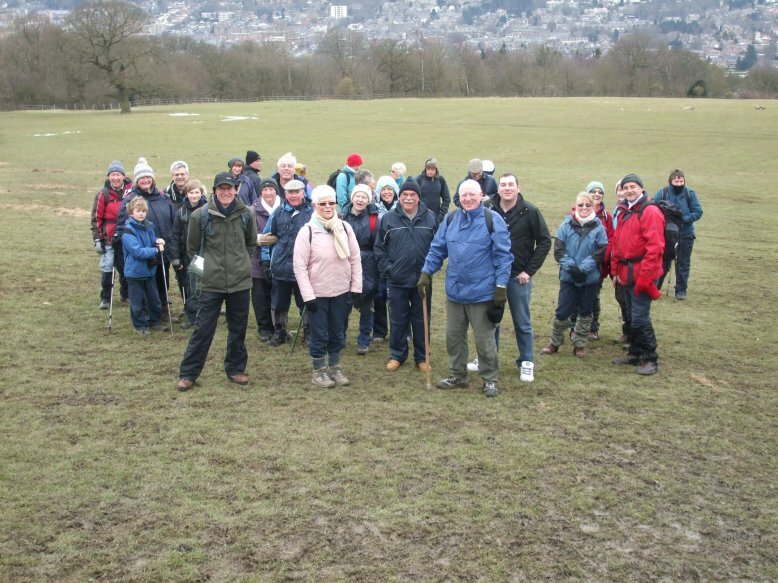 The walkers, 32 in number went their merry way towards the woods of Middleton and beyond. 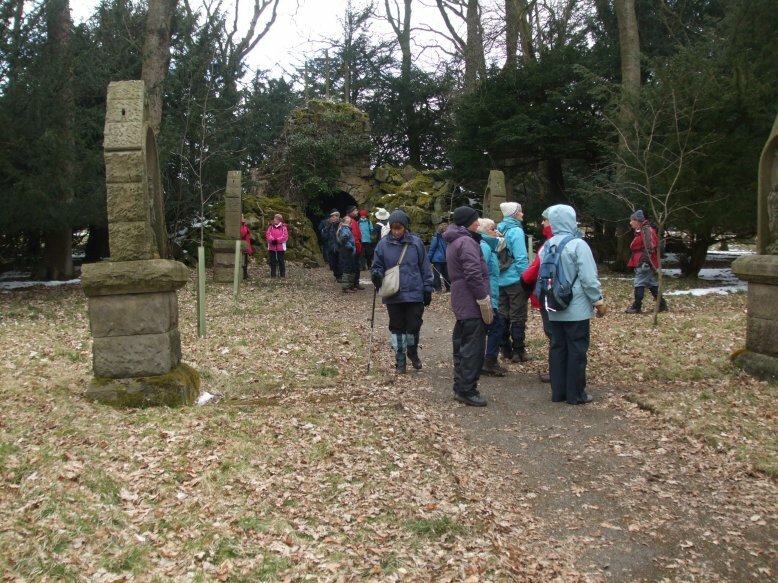 As they walked and talked of the numerous and varied happenings and events of the past few months, they did gaze on the Holy place of Middleton Lodge. 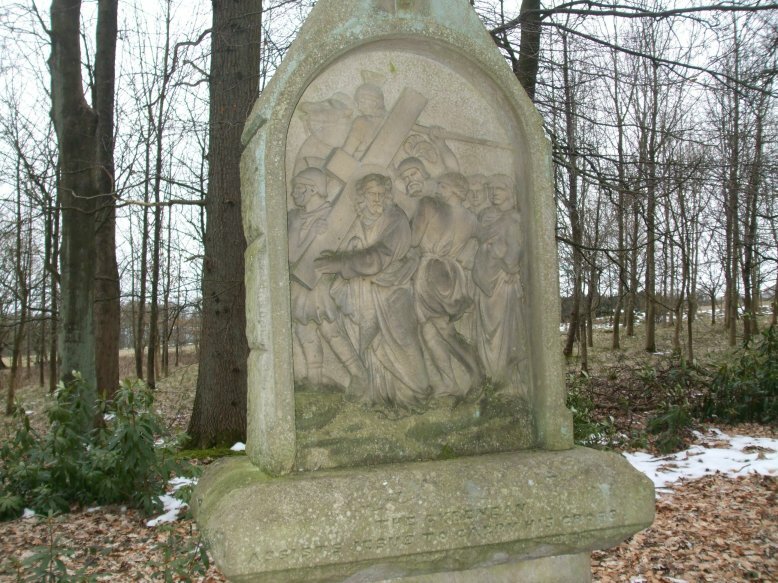 Before too long the ramblers came to a most interesting and sacred place set aside from the path was a marvellous spectacle, amongst the trees was a place called "Calvary", a path leading to a cave or shrine and along the way by the path was a series of carved "Stations of the Cross". All too soon they had to leave this glorious spot. This place can be reached by car, with a short walk through the woods. The next important thing to look forward to was our lunch, after a while a lovely location was found, a grassy bank with a wall to lean back against and views against the Dales. With the appetites of the walkers satisfied and legs rested it was time for the throng to continue their journey. Along the walked track there were grass fields occupied by horses and ponies. Some of these were interested by or inquisitive of the passage of people, their inquisitiveness was rewarded as they were offered " polos ". It was downhill from now on, descending the Dale side to join the road and path by the riverside back to Ilkley. 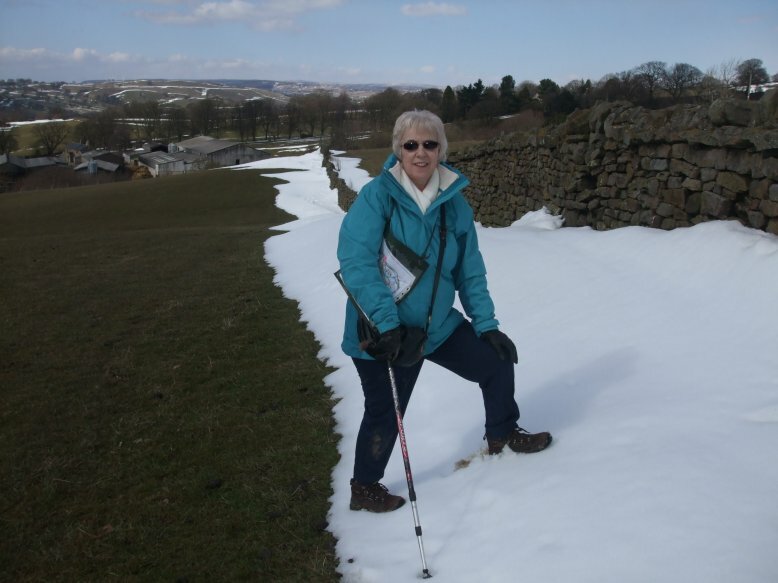 The coach returned from Skipton with the others of the group, after a change of footwear by the walkers it was into town to find liquid refreshment in the many cafes and hostelries, and it was good. At 4pm the party boarded the coach for the short journey to the "Wharfedale" for their early evening meal and an excellent meal it was. Thank you to the two damsels for running the raffle, a handsome sum of £57.00 was raised . Thank you to Neil our coach driver, for a safe and comfortable trip. Thank you to Paul for arrangements for the day. Most of all a huge THANK YOU to Anne for all the anxious hours that went into organising the evening meal.